Stuffed Fables is an AdventureBook Game – an exciting new product line from Plaid Hat Games. 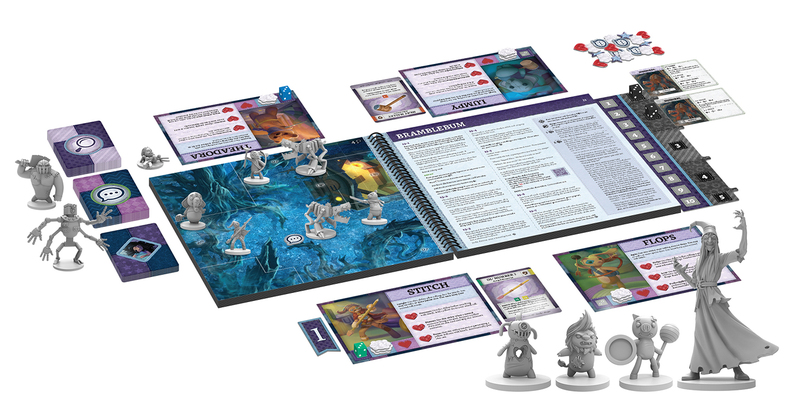 In an AdventureBook Game all of the action takes place in the unique storybook – a book that acts as your rules reference, story guide, and game board, all in one! Sworn to protect the little girl that loves them, a group of stuffed toys has been drawn into the Fall, an otherworldly, fantastic realm ruled by a brooding master of nightmares. Click here to download the Stuffed Fables rules. Click here to download the Seasoned Stuffies (advanced) variants. Click here to download Lost Story #1. Click here to download the Stuffed Fables coloring book, including all new Stuffies!